The seventh album of idol group TVXQ (Max Changmin, U-Know Yunho) is experiencing immense popularity both and in and outside of Korea. Released at noon on the 6th, TVXQ’s 7th album ‘TENSE’ album currently (10:20am, January 8th) the iTunes album charts in Vietnam and Japan. Not only this, but the album has landed a spot on the iTunes Top 10 Charts in Singapore (2nd place), Thailand (2nd place), Hong Kong (6th place) Indonesia (7th place), Taiwan (7th place), the Philippines (8th place) and Malaysia (10th place). ‘TENSE’ came in at 253rd place on the iTunes charts in the US, the biggest music market in the world. 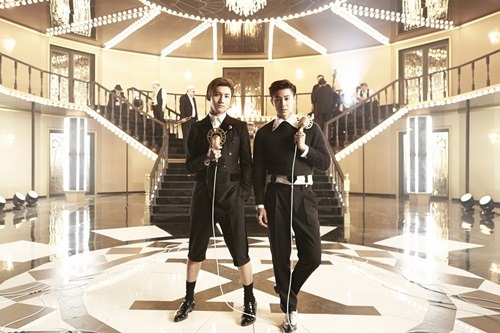 TVXQ’s 7th album, which was created to commemorate the group’s 10th anniversary, topped various digital music and album sales charts in Korea, and is now succeeding overseas, proving the power and might of one of Korea’s original K-pop stars. Meanwhile, TVXQ is currently busy promoting ‘Something’, the title track of their 7th album. thanks for the translation as always!